Spanning nearly four acres along the posh residential riverfront in Miami is the Nautica, a seven-story property featuring townhouses, villas, condominiums, and lofts. Newly constructed in 2003, each unit features a cityscape or waterfront view through floor-to-ceiling glass doors, along with many other luxury amenities. 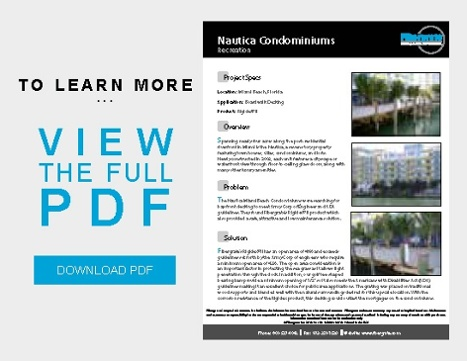 The Nautica Miami Beach Condominiums were searching for bay front decking to meet Army Corp of Engineer and ADA guidelines. They found Fibergrate's Rigidex® II product which also provided a safe, attractive and low maintenance solution. Fibergrate's Rigidex® II has an open area of 46% and exceeds guidelines set forth by the Army Corp of engineers who require a minimum open area of 43%. The open area consideration is an important factor in protecting the sea grass as it allows light penetration through the dock. In addition, our golf tee-shaped bearing bars provide a minimum opening of 1/2" so it also meets the Americans with Disabilities Act (ADA) guidelines making it an excellent choice for public area applications. The FRP grating was placed on traditional wood supports and blended well with the natural surroundings desired for this upscale location. With the corrosion resistance of the Rigidex product, this decking could outlast the mortgages on the condominiums.